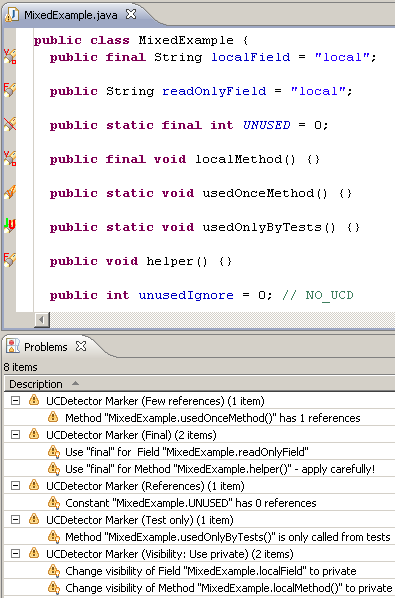 UCDetector needs Eclipse >= 3.4 and java >= 5.0. Repeat step 1. to 5. Really want to change code? It's good idea to do a full text search in workspace for the piece of code, you want to change. It is possible to change several problems at once using quick fix dialog. * Class is only used by reflection. * Write a // NO_UCD comment at the end of the line. * This line will be ignored by UCDetector. * Add a @SuppressWarnings("ucd") annotation. * This class/method/field will be ignored by UCDetector. If you want to "pollute" your code, you can use the @org.ucdetector.util.UsedBy annotation located inside ucdetector-annotations.jar which is inside org.ucdetector.source_x.y.z.zip. To avoid eclipse Warnings "Unsupported @SuppressWarnings("ucd")"